The coaching inn dates from the 15th century, nestled away in the National Trust village of Lacock. 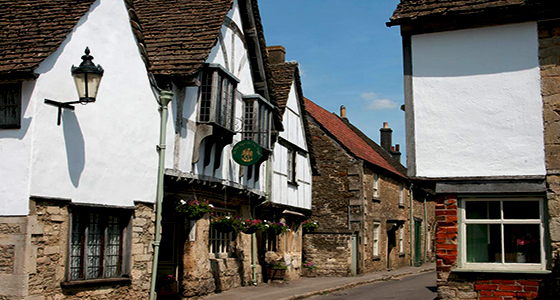 The village set in the Southern Cotswolds, has been used for the shooting of many films and period dramas. Nearby is the 13th century Lacock Abbey, which features in Harry Potter and a small museum dedicated to the memory and work of William Henry Fox Talbot, inventor of the first photographic negative. Rachel: I visited and stayed at the hotel on the recommendation of a friend who lives locally. The building's age certainly gives it a uniquely distinctive atmosphere and the gorgeous, comfortable bedrooms and bathrooms are furnished perfectly with antiques. If you stay in the colder months, you can eat your delicious dinner in front of a large open wood burning fire which sets the scene nicely for a recording session. Although staying here by myself I never felt truly alone. EVP 1: The speaker is almost childlike but not quite, however at 11 pm when the recording was made, there were definitely no sounds of children in the corridor or bedrooms. EVP 2: This well spoken gentleman makes his feelings very clear and he made no further attempt to communicate. EVP 3: It is unclear what the speaker will not do for eternity, this was the only sample of his voice captured on the recording. EVP 4: This message is said with a lot of passion. There is no idication of whether the speaker was calling Rachel stupid or an unseen communicator. EVP 5: This exceptionally clear gentleman uses the past tense; he was Dale Armson. Sadly we have not been able to trace anybody with that name to the hotel or village.